Genuine Italian calfskin lined with soft glove leather. 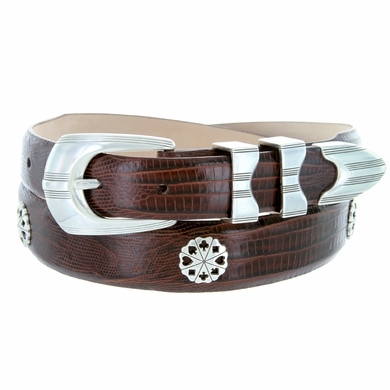 Sterling silver Plated Buckle set with double loops is accented with Sterling silver plated 5 Poker Card Suit conchos. 1 1/8" wide tapering to 1" wide. available in Smooth leather, Italian Calfskin embossed with lizard or Crocodile Grain.